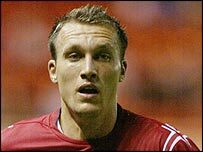 Norwich have completed the signing of Crewe striker Dean Ashton for a club-record £3m. The England Under-21 striker signed a three-and-a-half-year deal with an option of one further year after passing a medical on Monday. The cost could rise by £500,000 and there is a 20% sell-on fee. "Dean is one of the best young strikers in the country and has scored goals for Crewe on a consistent basis," said Norwich boss Nigel Worthington. "I'm delighted that we've been able to attract such a young talent to Carrow Road." The England Under-21 striker met club officials and was persuaded to sign for the Premiership strugglers on Saturday. Ashton is the Championship's top scorer this season with 17 goals, and had been watched by several Premiership sides. Crewe manager Dario Gradi says Ashton is ready for the Premiership. "It is time for him to go on and test himself at a higher level. He is ready and heading in the right direction," said Gradi. "Norwich are a good club. They are a very well run club, and it would be a great chance for him if he wants to go there. What a signing this will be; this could be the start of the Norwich revival! "I've made no secret of the fact that I would like Dean to stay into the summer - but with Norwich trying to retain their Premiership status, the deal is now or never for them. "We understand that, and maybe the offer wouldn't be there in the summer." Gradi added: "I know people will be disappointed if Dean goes, but the exciting thing for us is that there is a chance for others to come through. "We have strength in depth, better than we did last year. "